Join us for Valentine's Day! Check out our website for our special menus. We are proud to introduce our innovative gourmet Box Lunch. Enjoy a wide array of lunch. Our menus are perfect for a day to day meal or an executive meeting. Our box lunches are hassle free and sure to impress any staff or client. Let us take care of you. Located in a 165 year old building in the heart of historic Shockoe Slip, Sam Miller's is on the National Registry of Historic Places, and has been featured in national publications including "Southern Living Magazine." In addition to fine seafood and "the best crab cakes in Richmond," we serve USDA Prime beef , creative pasta dishes, and salads to suit any tastes. Looking for something more casual? A small plates menu is available in our Oyster Bar featuring classic favorites and new lighter fare options. Whether you are looking for a fine dining facility to host your business dinner, or a casual place to meet friends for drinks, Sam Miller's has all the options to satisfy your needs. This restaurant was dead at 6pm on a Saturday with only one waitress working a large party and 3 other tables. We had an appetizer and drink and walked down to another restaurant with better ambiance and food. We were a table of 8 adults at Sam Miller's on a busy Saturday night. There was no issue at all with the service [Kevin was terrific] and everyone was very happy with what they ordered. Beer was nice and cold, the wine was great and the price on everything was quite reasonable. Great atmosphere with a big bar. What's not to like ? Very disappointed to make a reservation for six people on Saturday via OpenTable, only to find that the restaurant was closed for the weekend. We were on a tight schedule and had to wander around the neighborhood in the dark, in the rain, to find an alternative. Made a reservation but the dining room was pretty empty for a Friday night. We ended up sitting at a bar booth because there was no happy hour in the dining room. Even on happy hour the food was pricey- $8 for ONE TACO. And the food quality was good, but not great. Probably wouldn’t go back for happy hour. We were not impressed. The wait staff was very nice, but our food and table location were awful. The herbed rosemary bread was served with honey butter (not a good combo, think the kitchen messed up), the oysters Rockefeller app were soupy and bland/under seasoned (kuddos for using lots of fresh spinach, but it needed to be drained), while the scallop succotash small plate was horribly over salted almost to the point it was inedible. The server was attentive (we needed 4 refills on water to get through the meal) and the wine from the bar was good and cold. We didn't stick around for dessert. Service was horrible. Waitress seemed friendly enough but woefully incompetent. From mixed up drink orders, to totally disappearing between appetizers and salads, to then screwing up dessert order. And this was all a prix fixe menu with limited options. Food was not bad but portions very small...3 small raw oysters for appetizer, Chilean sea bass entree perhaps 3 oz. at most, and no bread/ rolls offered... $220 before tip for 2 people and left hungry. I will not be back. The restaurant was over booked. It was apparent that extra tables were set up behind the bar. We were seated there even though they had an open table in the main dining area and we had a reservation. We asked to be seated in the main dining room but was told that the table was reserved! What??? I had a reservation but got a overflow table. The table was also not set. We waited 20 minutes and no one came to set up the table or take our order. We decided to check online for a different restaurant and fortunately found a great restaurant nearby. We left and do not intend to return to this establishment. Calamari appetizer looked so very good, however, two of us barely ate half of it as they were so rubbery and chewy that they were, in effect, inedible. Very expensive overwrought lunch. We enjoyed wonderful food and a nice wine while catching up. Ambiance was great for this. This place is overall a disappointment. Mediocre seafood in a fancy atmosphere. Our waiter was outstanding. He knew how to present and pour champagne, was available and attentive but was not in our face all the time like most servers. The food was disappointing overall. The shrimp appetizer was over cooked improperly so as the shell fused with the meat and was served with a sauce that must have been just ketchup. My crab cakes were properly done but was served with a corn maque choux that would get you kicked out of the state of Louisiana; complete lack of Cajun spices and cooked down creaminess. I had higher hopes. In general, find another place if you want to have a nice seafood dinner. Three of us made a reservation for lunch at 12 noon. We requested and were provided with a booth. Service was slow. It took 5 to 10 minutes for anyone to come to our table just to provide water. Another 5 to 10 minutes to place a drink order - nothing complicated - iced tea. But then to give our food order it took yet another 5 to 10 minutes. Then we waited for 20 to 25 minutes for the food to be served. Most people who work downtown have 1 hour for lunch, so to have to wait 45 minutes for food to arrive is just way too long. Everything was wonderful! Loved the oyster appetizer! It's been a while since I've been to Sam Miller's and I probably won't visit any time soon. My burger was very okey doke, pretty much tasteless even though it was supposedly a bleu burger. My party was noncommittal regarding their selections which leaves me to believe they too were wishing we had gone elsewhere. Oh well, the place is still around so I guess someone still likes it but me--not so much. My first time there and it was amazing. The food was awesome and it had great ambiance. We had a table in a corner along the street and could watch the goings on outside. 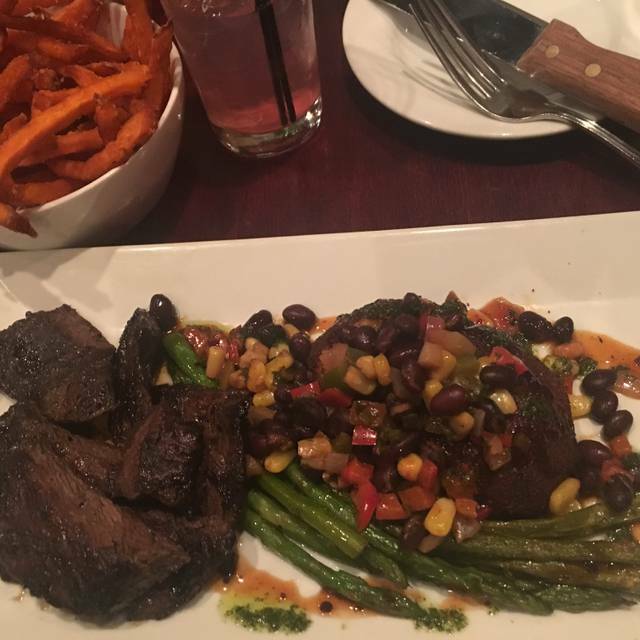 Our server was knowledgeable regarding the menu and specials. She was attentive while handling our table of 4 and made good meal suggestions. Well done. Marvelous choice for Thanksgiving dinner. Having options beyond the traditional dinner meant everyone in our party could decide what he/she wanted. I enjoyed a lovely filet with grilled sprouts and sweet potatoes. The crab soup starter was rich and flavorful. Highly recommend this restaurants for their menu - inventive and flavorful. No toilet paper in bathroom. Not very clean. Too many choices that are better and cleaner. Dined at Sam Miller’s while in town for a conference. Location was conveinent as it was less than a block from the hotel. Staff was freindly, courteous and was frequent in ensuring customers were comfortable and had everything they needed. Food was excellent. Well prepared. Ambience was nice. Noise level moderate. I would recommend to anyone looking for a nice meal in that area of town. The food was amazing. Such great ingredients which made the meals one of a kind and so tasty. I would recommend this place to anyone. The chef makes such amazing and unique plates. It is a great local spot. They also had a great cocktail menu. The staff is so accommodating as well. They have rooms for venue spots as well, another great plus to Sam Millers. Pretty good food, but the service was sub par. Took 15 minutes to get a glass of wine after ordering, and watched my wife's drink sit on the bar for 5 minutes after that before it was brought to the table. Once appetizers showed up, dinner progressed pretty nicely. Would definitely go back, just not during Restaurant week. Nice lunch (a bit expensive though). Crab soup is always good. My tuna wrap was okay, next time will go for the crabcake as it looked much better. May have to try this place for happy hour as the bar looks very nice. What a tasteless, tourist trap joint. Lousy food. Just the right level of interaction with staff. Went for lunch with a group of 6 on a Saturday. We were sat quickly and our food came out fast! Everyone in our group enjoyed their lunch! Great space for adults and age 5-11 year old grandcchildren--nice ambiance and food selections for Mother's Day Brunch. We'll definitely do it again next year! Excellent service, food/drink, and atmosphere. Thank you!!!!! Went out for restaurant week 2018 with my girlfriends. I was very impressed with the food. Presentation was wonderful, crab cakes were excellent.. I am definitely looking forward to going back again. Went during Richmond restaurant week and was very pleased. Loved the ahi tuna appetizer and the desserts! Lovely menu and great employees. Food was fab! Went in a group of 8 and everyone enjoyed their food. Samatha is a terrific server, very personable. The crab soup was delicious. The shrimp was the best I’ve ever tasted. The chicken wings were hands down the best we’ve ever had. Also has a salad with warm blueberries and balsamic dressing. Outstanding. All in all, we would definitely go back and recommend everyone try this restaurant . I had not been in Sam Miller's for about twenty years when friends from out of town and my wife and I had dinner there. Despite my good memories of years before, the restaurant was not clean, even the menu was spotted and dirty, and the food was merely so-so in quality though quite generous portions. Our server was inexperienced and somewhat sloppily dressed, and was not attentive to our needs nor graceful in his service. Oddly, having made reservations through Open Table earlier, we stopped by to look at the menu that afternoon and were warned by the hostess that they were accepting no more reservations for that night. When we arrived, the restaurant was not busy, with many open tables and stayed that way throughout our meal. First time eating here. Noted the large seafood entrees but good choices. Coming from a seafood city found their choices were good but not the best I have eaten. Would probably not go back. I think it would be fine for those who like seafood in general. Was a loud party of girls soccer players there which accounted for the noise, but not for the first 2 entrees which were sold out by 6 pm, and the wine which they didn't have but replaced with a warm bottle of another "equal" wine. The corn meal dusted trout was very good, as were the fried oyster appetizers. Hush puppies were little overcooked rocks. Disappointing despite a charming waitress. Delicious fried oyster appetizer - maybe best I have ever had. Very good cream of crab soup. Myself and some fellow work colleagues enjoyed a lovely Valentine's dinner at Sam Miller's while visiting Richmond for business. The food was delicious and the drinks were fresh. Our server Mel was so attentive and eager to make our experience wonderful. The lobster corn chowder was perfection. Had a great lunch with friends! Service and food was fabulous. Great atmosphere! Will definitely return at some point. Trying to get into Town more often to experience all the eclectic food finds. We were very impressed with the welcome and the service we received. Our server was excellent and made suggestions as it was the first time some of us had been there. Food was well prepared and presentation excellent. I enjoy coming to sam millers for special occasions due to the location and the historical building. We come for the food and ambiance.